Depending on how the current model has been configured in the WebEA configuration file and your security access to the model, you might have the ability to create a range of objects in the model through WebEA. These objects include: Packages and diagrams; elements such as Use Cases, Requirements, Components, Changes and Issues; and features of elements such as Tests, Decisions, Defects and Events. You can therefore define additional scope or problems that have arisen, directly in the model, with precision and in detail, adding to the accuracy and quality of the solution that the model represents. The Project Manager responsible for the model should guide you in how to create objects and in the purpose of you doing so. In addition to adding new elements you might also be able to edit the Notes of any object regardless of type, and the details of element Tests and Resource Allocations for any element in the model, whether you have created it or not. See the Edit Objects Help topic. Note: the ability to Create objects is only possible in the Premium (Small Business, Team and Enterprise) editions of the Pro Cloud Server. 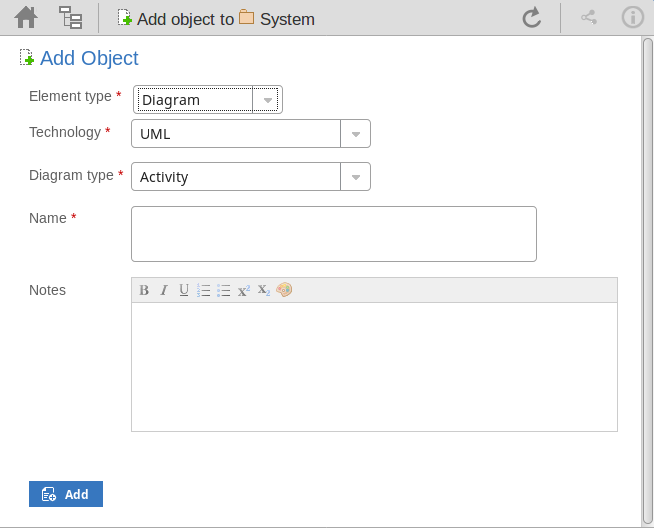 You can quickly establish if you have the ability to create objects in WebEA by checking the Browser or the Main View - Object List. If you are able to create objects then the final item in the list will be a '<new>' button. Click on this button to display the 'Add Object' page. This is an optional field that is only visible when 'Diagram' is selected as the element type. It allows the selection of a Technology that provides an additional set of diagram types. This is an optional field that is only visible when 'Diagram' is selected as the element type. Click on the drop-down arrow and select the type of diagram to create. Type in an appropriate name for the object, preferably giving some indication of its purpose or function. Type in a more detailed description of the element, such as why you are creating it and what other elements it might be associated with. You can, again, quickly establish if you have the ability to create element features in WebEA, by displaying the Properties of an element in WebEA's Main View; if the icon displays in the right corner of the element name/notes panel, you can add element features. Select the appropriate option; a dialog displays in which you complete the fields to define the feature for the element. Each type of feature has a different dialog; refer to these topics for the details appropriate to each dialog.